The decision by President Obama, egged on by his then-Secretary of State Hillary Clinton, to depose Libya’s long-time leader Muammar Qaddafi in 2011, led to near-complete chaos inside a country that had been otherwise stable since the 1960s. This lead directly to the tragedy at Benghazi, a massive flow of weapons out of Libya into Syria and elsewhere, the spread of violence into neighboring Mali and French intervention there, and turned Libya into an ungoverned space and a new haven for ISIS and other terrorists. Not content with that, the U.S. is about to double-down on the mess with the deployment of additional troops on the ground. The U.S. military’s top general said Thursday the Libyan government is in a “period of intense dialogue” that could soon lead to an agreement in which U.S. military advisers will be deployed there to assist in the fight against the Islamic State. There is interest among some NATO nations in participating in the mission, Dunford said, but the specifics of who and what would be involved remain unclear. “Unclear” and “Interest” when used in that way typically mean the U.S. will be going it more or less alone, with maybe a smattering of British and French thrown in for political/PR purposes. 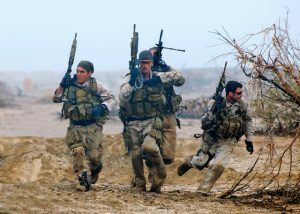 “There will be a long-term mission in Libya,” Dunford said. U.S. Special Operations troops have been deployed in the Libyan cities of Misrata and Benghazi since late last year, though the Pentagon only officially admitted that recently. The U.S. has conducted sporadic air strikes into Libya over the past few months. The advising mission will be complicated by political issues. Libyan Prime Minister Fayez Sarraj’s “government” that the U.S. thinks it will be supporting in Libya has not yet been accepted by existing rival “governments” in Libya. For Sarraj to hold power, he will require support from militias in Misrata and forces loyal to General Khalifa Hifter, a former Libyan military officer who launched his own war inside the country in 2014. The Misrata militias and the Hifter militias have fought one another from time to time, and uniting them behind a third party seems a difficult task. NOTE: If you chose to get in bed with the Devil, well, don’t be surprised if you get screwed.